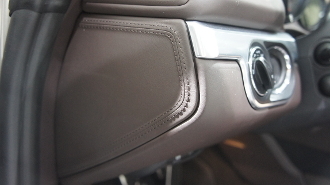 The Exclusive Option Leather Stitched Dash Endplate Trims feature contrasting stitching on the outside edge that complements the rich leather surface. These endplates are an easy snap-on installation that instantly adds an exclusive look that matches the dashboard perfectly. Replacing the cheap plastic with rich leather gives your Porsche an exotic feel that instantly sets your Porsche apart from all others. Perfect for those car meets and shows where the Porsches doors are swung open to allow an open view of your beautiful interior.